Adding protein rich nuts and delicious quinoa makes a simple kale salad more of a meal. Satisfying for a healthy lunch, and full of nutrients and fibre to keep you going until dinner! 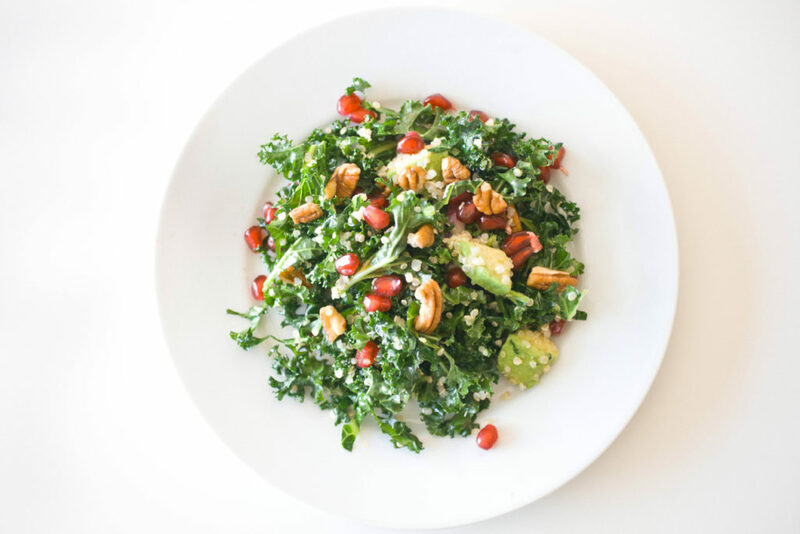 If you think you don’t like kale, try this salad… It may just convert you to a kale lover! The important thing when preparing kale is to remove the tough rib, and finely shred the leaves with a sharp knife. It also helps to massage the dressing into the leaves with your hands. Lemon Vinaigrette (shake all ingredients in a small Mason jar) – this will make enough for a couple of salads. Make the dressing first. Remove the ribs from the kale (discard the ribs), and finely shred the leaves. Massage the dressing into the leaves (you likely won’t want to use all of the dressing, so start with half). Add the cooked and cooled quinoa, and the nuts, and toss to blend. Top with the avocado and pomegranate. Enjoy!